Similar to other minority groups, parents of biracial children must prepare and protect children to navigate the harsh realities of being a minority, to instill pride, and to pass on knowledge, traditions, and history. Yet, unlike other minority groups, many parents of biracial children are not minorities and lack firsthand experience with what it means to live beneath this veil. Further, many parents are monoracial and don’t know what it means to be biracial, to embody multiple racial (mis)constructions with few examples or role models to lead the way. 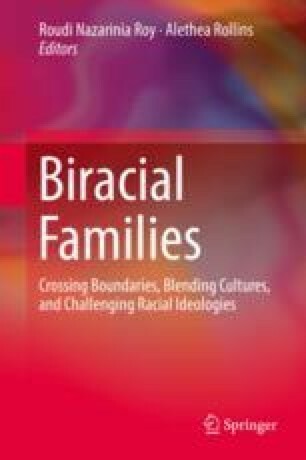 This chapter provides a review of the racial socialization literature, explicating unique considerations for biracial families. In addition, this chapter discusses developmentally appropriate strategies, identifying important considerations for preschoolers, school-age children, and adolescents. This chapter concludes with recommendations for future research and considerations for professionals working with biracial children and their families. My son Nicholas is 3 years old and attends a predominately White Christian preschool. I was picking him up a little early one day and was chatting with his teacher while he was washing his hands and getting his stuff—and a little girl ran up to me and started chatting and telling me what they did that day and she pointed over where she was playing and there were three other little girls sitting reading books and she started to tell me who each of them were, “that one with the butterfly shirt is Blair, and that one with pink is Anna, and that Black one is Aiyushi.” I was caught off guard by her choice to describe this little (what appeared to be) Indian girl as Black; and that she was attempting to identify her racially while describing the other children by their clothing. The other children and the little girl were White. This experience made me wonder how she would identify my biracial son (who looks Black). I had never used racial terms to describe him, our family, or anyone. Taking his lead, I had always described him and other people of color as brown or peach or vanilla. He was just learning his colors. I didn’t want to confuse him with racial terms. But, I quickly learned that if your child interacts with anyone outside of your home you have to be prepared to talk about race before it is developmentally appropriate.